Her mother was an art major at the University of Michigan, and her father spent 36 years as an FBO, so it’s not surprising that Kristin Hill wound up combining those two passions into one. She did so by forging a highly successful career as an aviation artist. Hill’s introduction to aviation came when she was two months old and went for her first flight with her father. The decision to focus her future on art came when she was a junior in high school. Early on, she discovered the special fascination of flight that pilots know so well, but sometimes find hard to put into words. It’s an important element in all her aviation paintings. Her description of the sensations aroused in soaring through the sky, high above the hills and valleys, rivers and lakes, broad pastures and fields of grain, accomplishes that perfectly. It also puts her emotions about flying and art into a vivid perspective. Hill says that’s why skyscapes play such an important part in her paintings. “I sometimes make sketches of the sky when I’m flying, and use them later as background when I’m painting a plane in flight,” she said. For all her hours in the air in a wide variety of both civilian and military aircraft, Hill has never gotten a pilot’s license. Hill went to Mary Washington College, which had been the girls’ school of the University of Virginia. Hill said she didn’t initially think of aviation art, but became interested in it after she got out of college. In 1980, she became a part of the Air Force Art Program, and today a number of her paintings are in the Air Force collection. Hill said it symbolized Adam and Eve, good and evil, and health. However, the PR person for Dover Air Force Base told her she couldn’t do that, because those in high ranks would consider it inappropriate. Hill has flown in a number of Air Force aircraft, including the P-51, B-17 and B-25, and on one flight, she had a frightening experience. She was in an A-37, flying out of Willow Grove Air Base near Philadelphia, when they suffered a double compressor failure right at rotation. The pilot elected not to drop his stores (the auxiliary fuel tanks under the wings) because when released they might travel as fast as the aircraft and could ignite from impact and abrasion. The additional weight would make it harder to stop and he wasn’t sure he could stop before the end of the runway. “It was a bitter cold day in February, and there was a strong headwind that helped slow the aircraft down; he was able to stop in time. The only problem he had was hot brakes,” Hill related. She flew the mission the next day in another A-37. The resulting painting showed an A-37 pilot guiding an A-7 over a frozen river, on the way to the bombing range at Harrisburg. Hill has flown quite a bit with the Air Force and Air National Guard. Among the aircraft she’s flown in with them are the C-5 Globemaster, A-7 Corsair 2, the A-37, the KC-135 tanker and the F-4 Phantom. The painting with which Kristin probably most closely identifies with is “Breath of Magic,” which depicts a Pitcairn Mailwing flying low over a river running through a valley in the foothills of North Carolina. There’s a small cabin in a clearing a short distance up the hill from the river, and two people are running down to see the plane go by. 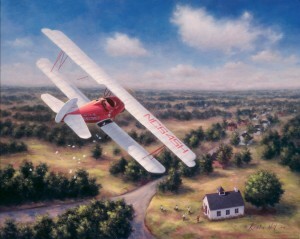 One of Hill’s more striking paintings is “School’s Out Early,” which shows a single-engine Travel Air biplane buzzing a small rural school on a country road. The children have run outside to wave at the airplane. Hill researched that work with a flight she took in a Travel Air. 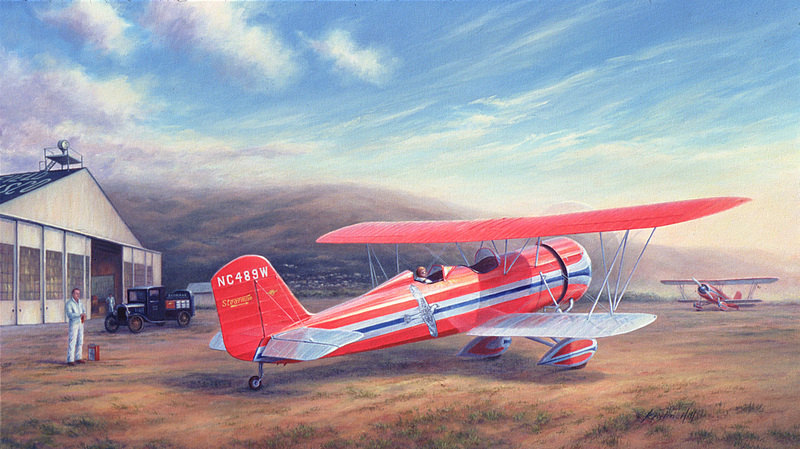 While working on the commissioned painting “Stanavo Speedmail,” Hill’s talents were employed in the recent restoration of the old biplane when she hand painted the 40-inch Stanavo Oil bird on the sides of the Speedmail. The oil painting of the historic scene portrays the plane at the Standard Oil Company’s 1930 aviation base at Mills Field, now San Francisco International Airport. 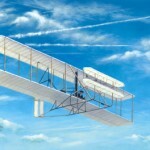 “Wings to the Future,” our cover photo this month, depicting the Wright Flyer, commissioned by Global Aerospace, was recently completed. Although she’s painted a host of old-time aircraft, she hasn’t ignored the more modern flying machines. For instance, she did a painting of the Concorde. A painting she did of a G-IV with beautiful cloud formations in the background, “Rendezvous with Mercury,” won Hill the 2002 Women in Aviation International Award. A woman she met at a WAI conference who flies G-IVs and G-Vs for Universal Studios inspired that painting. 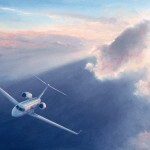 Another G-IV she was commissioned to paint was one belonging to Rolls-Royce. Hill presented that to Sir Ralph Robins, the company’s chairman, at the Chairman’s Luncheon where he was honored on his retirement. 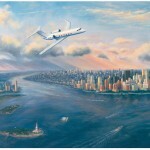 “My Transatlantic Dream” shows the aircraft with the New York City skyline in the background. Hill flew with Denise Waters, who had flown in the London to Sydney air race, to take photographs of the New York harbor and southern Manhattan skyline that would guide her when she did the painting. Hill said that after spending two days with Poberezny, she realized there are people who have dreams and they pursue them, and there are people whose dreams help other people pursue dreams. “That’s basically what Paul did,” she said. Hill also painted George Preddy, the highest scoring World War II ace in the Eighth Air Force. The painting shows symbols on his P-51 for the 17 kills he had at the time. By the time he was shot down and died on Christmas Day 1944, he had 27 kills. 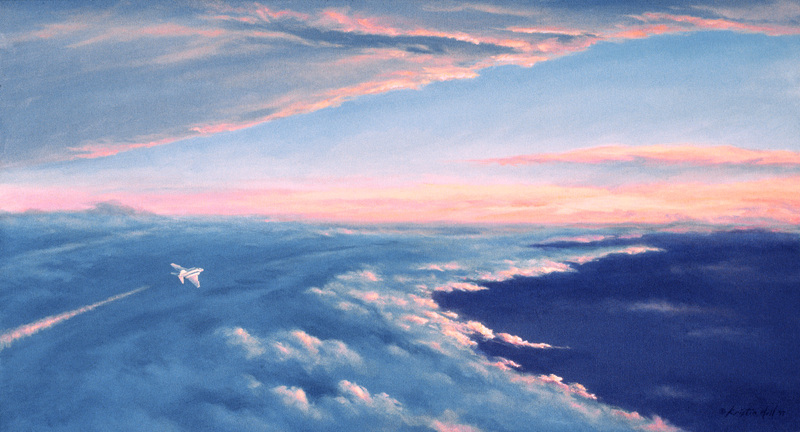 In honor of the Air Force’s 50th Anniversary, Hill painted an F-4, one of her favorite airplanes, flying away from the viewer toward gold and orange clouds, which symbolized the fact that the aircraft was near the end of its many years of active service, flying off into history. The gold clouds in “A Brush with Gold” symbolize the golden anniversary. Kristin Hill’s dad, Dudley Hill, who provided her introduction to aviation, had been a test pilot for Ercoupe when the factory was located near College Park Airport in Maryland, not far from the nation’s capital. During World War II, he went out to Phoenix for Ercoupe to help instruct on putting the turrets in PB4Y2s. He’s 83 now, retired, and still lives in Lancaster. Her mother, who hadn’t painted for many years because of other activities, is now back at her easel. Hill and her husband, Craig, who designs customized worldwide group travel trips, live in Lancaster also. Hill said she thought it would get easier to paint over the years, but she has found that it takes me as long or it gets harder because you understand how many more puzzle pieces truly exist to put in the work and you also expect more. Hill has put together a lot of puzzles over the years—adding up to some 250 paintings. And there will be a lot more, since she is working on a backlog of commissions. For more information, visit [http://www.kristinhillartist.com].